Pkg “F” Private Family Sunset Dolphin Cruise 3 Activities RESTING RELAXING REJUVENATING “Island Style” All Private .. No overcrowded decks w/strangers ! Bundle priced for up to 2 – 3 – 4 – 5 or 6 guests – For larger groups consider additional equipment or 2 Pkgs ! RATED AS THE BEST SUNSETS ON THE COAST ! 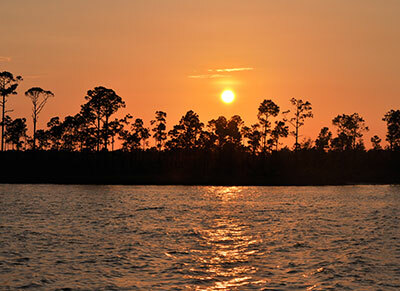 Our evening cruise is offered Privately for your family on one of our SSI Sports Executives. Our sunset cruise is all about seeing Dolphin ,beautiful natural settings and of course, setting out on a “one of a kind” Orange Beach Sunset Cruise ! Watch your children’s anticipation to see wild dolphin while they enjoy a sunset cruise with you ! No Crowds or Strangers with us ! So you can Relax on the bow, listen to great music and let you troubles melt away with the sunset!